I Was A Teenage Structuralist! 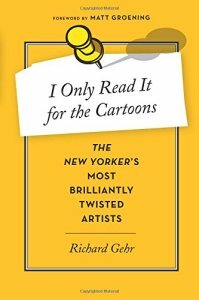 Richard Gehr’s new book, I Only Read It for the Cartoons: The New Yorker’s Most Brilliantly Twisted Artists (Amazon/New Harvest), profiles a dozen New Yorker cartoonists. We talk about the genesis of that project, lament the dearth of cartooning in print and online, bond over Abe Vigoda, and ponder why it is that so many New Yorker cartoonists had teachers or educators for parents. We also get into Richard’s history in the arts-journalism racket, the joys of Robert Walser, his time in the Boy Scouts with Matt Groening, how he built a career out of his oddball enthusiasms, and the most mind-blowing “Which celebrity did you totally melt down around?” story in the history of this podcast. (Seriously.) Give it a listen! Richard Gehr has been writing about music, culture, and travel for quite a while. He has been an editor for the Los Angeles Reader, Spin, and Sonicnet/MTV Interactive. He currently writes for Rolling Stone, Spin, The Village Voice, Relix, AARP: The Magazine, and other publications. He was a senior writer for the book Alt. Culture: An A-To-Z Guide to the ’90S – Underground, Online, and Over-The-Counter and co-authored The Phish Book with the Vermont quartet. His new book is I Only Read It for the Cartoons: The New Yorker’s Most Brilliantly Twisted Artists . He resides in the Brooklyn arrondissement. Credits: This episode’s music is Homesickness by Tsegue-Maryam Guebrou (because I’m on the road for a week). The conversation was recorded at Mr. Gehr’s home on a pair of Blue enCORE 200 microphones feeding into a Zoom H5 digital recorder. The intro and outro were recorded on the same setup in a hotel room in San Diego, when my voice was shot from a three-day podcast-athon in Los Angeles. Processing was done in Audacity and Garage Band. Photo of Mr. Gehr by me.